Early morning is deifnitely my favorite time of day in the garden. Morning dew, the cheerful chirping of birds, sleepy sunshine waking up, poking about to see what went on in the darkness, daydreams and endless possibilities. . .
--Another small but sublime serving of asparagus smothered in butter. --I did end up creating a unique arugula pesto the other day and have been experimenting with it (and eating gobs of the stuff--all in the name of research of course). Will write more about that hopefully soon. The Desperate Gardener & Her Potato Planting Experiment. This is why I love having a digital camera. Sometimes you just need to be able to capture moments like these and then rush into the house to look at them. And besides, being able to see all that work you've done makes it easier to rationalize buying all that Biofreeze. It rained all night long and is still pouring as I type this. I should have just gone and planted the bush beans in this bed yesterday. I mean, all the hard work was done. What would it have taken me--15 minutes tops? I have no idea what I was thinking. Probably too busy clicking back and forth between these photos. Good news! I just flipped the calendar over to May and discovered that the 2nd, 3rd, and 4th are all (like today and yesterday) fertile days in the first quarter--perfect for starting lettuce, herbs, greens, cruciferous veggies, cucumbers, beans, and flowers--pretty much anything but members of the potato/tomato/pepper/eggplant/squash families. 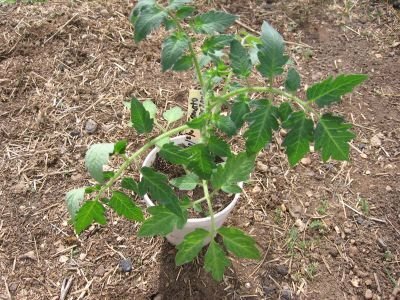 These you want to start in the second quarter; fertile days in May are the 10th, 11th, and 12th (but you've already started your tomatoes and potatoes and peppers and eggplant, right?) Wondering what all this moonsign stuff is all about? Read more here. So if your planting plans have been postponed like mine (it's been pouring rain for 17 hours straight and shows no signs of stopping), you can relax. There will be plenty of time next week to get everything done. Which is good because last night I found all sorts of seeds I forgot about, like the Nero Di Toscana Cabbage (beautiful plants that tolerate heat & humidity; the young leaves are fabulous in salads), Oriole Orange Swiss Chard (another gorgeous veggie), Red Russian Kale (yet another stunning beauty--hell, who needs to plant fussy flowers? ), and some Canton Bok Pak Choy--super stir-fried. All of these seeds are from Baker Creek Heirloom Seeds. This is in addition to the bush beans: Straight 'N' Narrow Haricots Verts and Masai (both of which I have planted every year for about 10 years because I can never remember which ones I like better), Emerite Haricot Vert (a new variety for me that I never got around to planting last year because I didn't realize it was a pole bean and that would have required extra plotting and planning), and of course my absolute favorite--the incredible (and talk about some gorgeous veggies) Dragon Langerie Yellow Bush Beans. This is actually a misnomer because these huge, prolific, incredibly tasty beans are not yellow, but are more of a creamy white with hard-to-describe pinkish stripes. Trust me, just grow some. They're so good raw I have never once bothered to cook them. They will make any crudite platter look like it was just dropped off by a four-star caterer. I recommend dipping them--and the rest of the crudite platter--in some herbed yogurt cheese. All of these seeds are from Pinetree Garden Seeds. So what is my new plan for today? Stay as dry as possible, try to figure out where I'm going to plant all this stuff, stop rooting around my seed packet stash, and revel in the fact that my garden is receiving a much needed soaking without my having to lift a finger (okay, I did actually start this rainstorm by watering everything yesterday afternoon). I suppose I could launch an attack on some of the clutter that has obviously been breeding around the house while I've been outdoors (how does that happen? ), but I'd much rather bake a few loaves of bread. A girl's gotta have priorities, and mine usually involve food. So what do you do when you're rained out of the garden? © Copyright 2006 FarmgirlFare.com, the award-winning blog where Farmgirl Susan shares stories & photos of her crazy country life on 240 remote Missouri acres. Love lettuce? 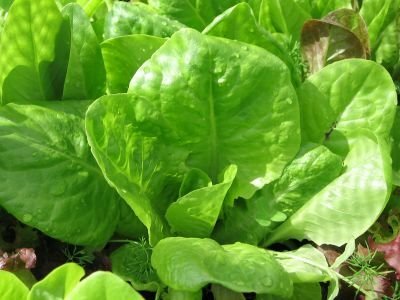 You might find my post How To Grow Your Own Gourmet Lettuce from Seed: It's Easier than You Think! helpful. And there are links to lots more favorite things to grow at the bottom of this post. Got a bumper arugula crop? Make some Arugula Pesto or try this easy, all-purpose Arugula Cottage Cheese Dip/Spread/Sauce. 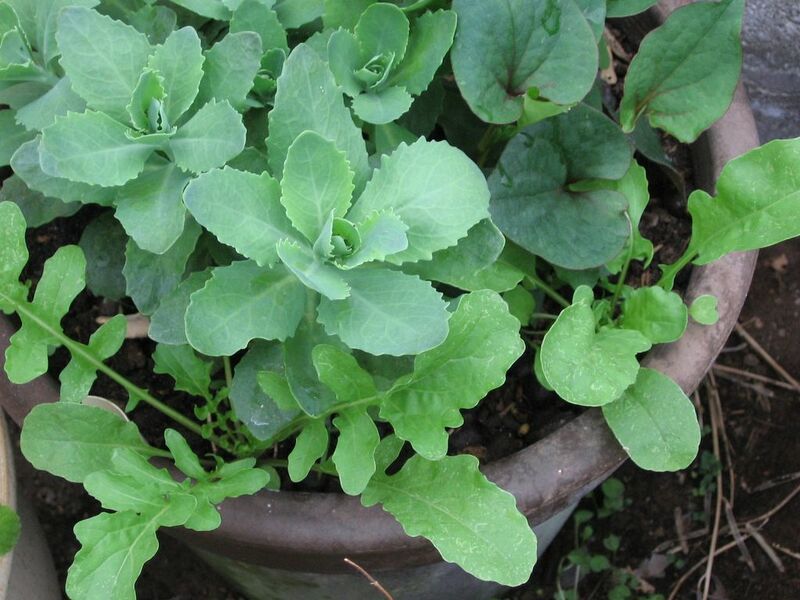 Arugula is so easy to grow I didn't even plant this. Really. This is what you get when you grow some arugula in the greenhouse, let it flower and go to seed, and then, months later, finally pull up the dried out stalks and plunk them down on an unused patch of bed on the other side of the greenhouse. 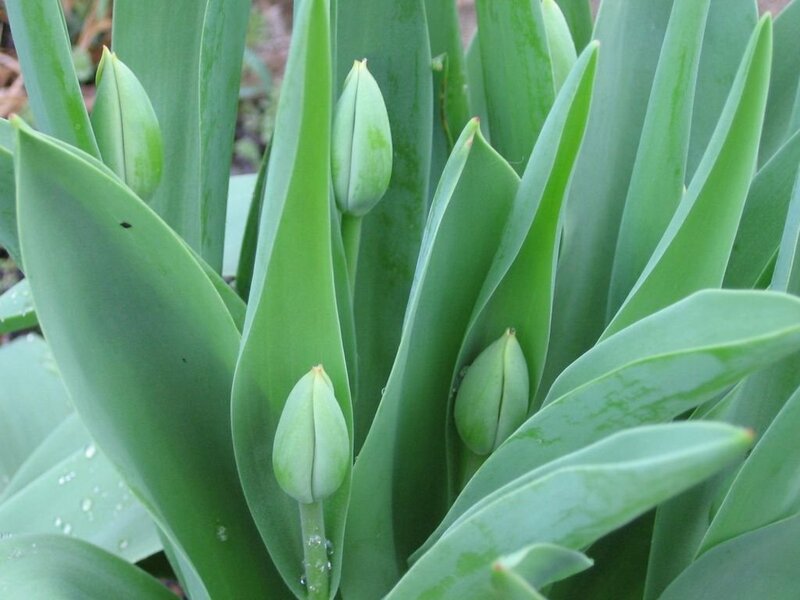 Ignore them all winter, then toss the stalks into the compost bin because all of the seeds have dropped out of them. Realize where the seeds have landed, and wonder if a little water might just sprout something. 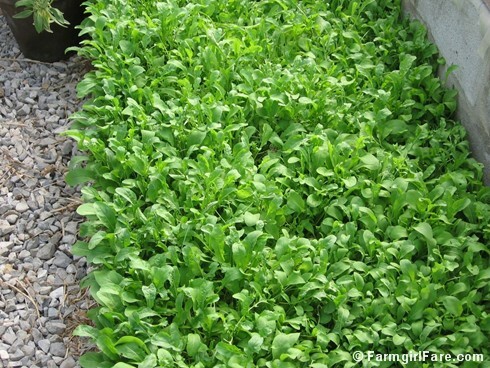 Lo and behold—an arugula jungle! 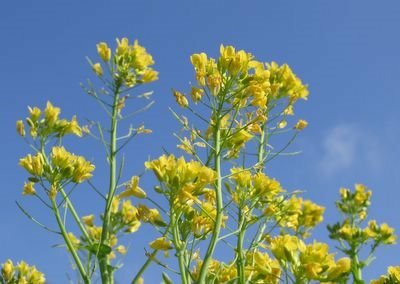 A little more about arugula below. But first, here are some photos to show you just how quickly you can grow yourself some salad. The photo above was taken on April 27th. I have no idea what this is. 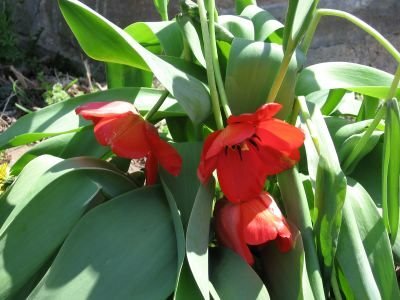 I bought it last fall at a garden center clearance sale for 50 cents and transplanted it into a bigger pot full of rich, composty soil--which it apparently loves. Somehow between then and now, its little ID tag has gone missing. All I know is that it's a perennial--and it's very pretty. And I have to figure out somewhere to put it. Am working on salad growing post. Arugula has taken over the greenhouse. --It was 36 degrees at 4am this morning. 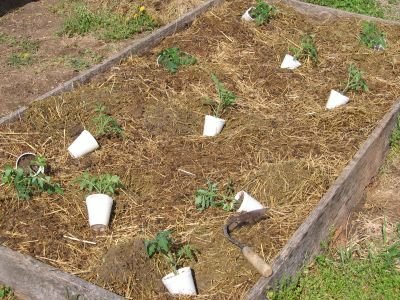 I had covered most of the tomato plants with reemay and sheets, but even the uncovered peppers and tomatoes look fine. Put all unplanted seedlings (which have been spending days and nights hardening off in the great outdoors) in the greenhouse for the night. --Planted some Orange Banana tomato seedlings in one of the raised beds on Tuesday. This is what Baker Creek Heirloom Seeds (from whom I bought my original seeds) has to say about them: "Unique, orange, banana-shaped paste tomatoes, bursting with fruity sweetness. Perfect for drying, canning, and paste. Also delicious fresh and great for specialty markets. Orange color is rare in paste tomatoes." Click here (and scroll down to the bottom of the article) to see one of my favorite ways to enjoy these sweet beauties. Well, the second asparagus harvest made it closer to the table than the first one--I ate it last night standing up in the kitchen. And I even cooked it. Steamed the spears and smothered them with organic butter. Oh my. 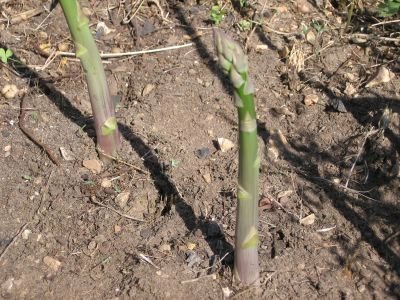 (Because I have such a small asparagus bed, not much is ready at once, and the ones that are often vary quite a bit in thickness. I fill a pot with a small amount of water, snap the spears in half or thirds (to fit in the pot), then place the thicker ones on the bottom and layer the thinner ones on top of them, out of the water. This way they all end up cooked just right.) There wasn't nearly enough, but of course I had a giant lettuce salad to go with it. I need a bigger asparagus bed. Much bigger. Like a quarter acre bigger. Tomorrow and Saturday are fertile days in the first quarter. These are the best days to plant nearly all seeds except the potato/tomato/pepper families. I'll be planting a couple varieties of bush beans and starting some basil seeds (cannot believe--pesto freak that I am--that I completely forgot to start them last month) and any other interesting herb seeds I find languishing in my giant seed storage container. Might as well use them up! 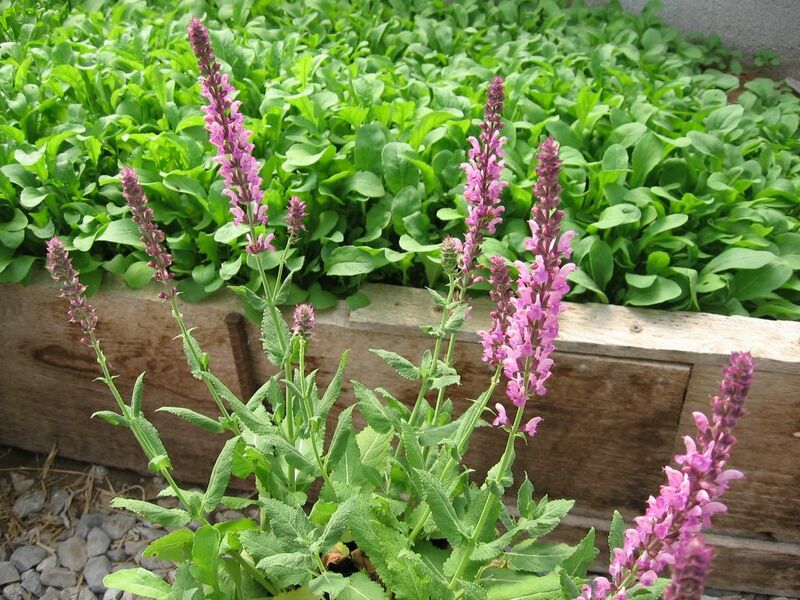 These are also great days to start lettuce and other greens from seed. Hopefully later today or tonight I will finally get around to offering some tips on growing yourself a little (and practically instant) gourmet salad garden. Unless you live in the South or other warm climate, it still shouldn't be too late to start one. Hint: it includes arugula (rocket). Also on today's agenda: clearing out some beds for the beans! My experimental companion planting in the onion plot is, so far, a semi-success. 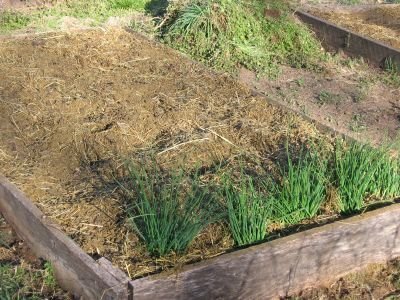 Back on April 1st, I planted five rows of onion sets in one of my 4' x 8' raised beds. Between the onion rows, I sowed three kinds of beet seeds and two kinds of lettuce seeds. Usually I simply mulch the entire plot with grass clippings once the onions have poked up. Great in theory, but not so great in reality. I think part of this was my fault, though. Okay, the Bull's Blood beet seedlings have come up nicely, and, as you can see in the above photo, they are doing a good job at blocking out the weeds. I think if I mulch around them and the onions with grass clippings right now, we should be able to stay weed free until harvest. However, further down the row we come to the Detroit beets. The leaves on these seedlings are smaller and the planting is slightly thinner. Thick, nasty grass has sprouted up all over. These are tough little weeds that are not easy to pull up without disturbing the adjacent beets and delicate, shallow onions. And they are so close to the ground it is hard to snip them at the base (which can work very well with some types of weeds). I'll do what I can and then mulch with grass clippings. Next we come to the row of Dark Lolla Rossa lettuce, and it is definitely a troubling sight. As you can see, the tiny lettuce seedlings are being obliterated by the same nasty grass. This is what I was afraid of. I'm not sure there is hope for this lettuce. If I simply leave the weeds in place, I think they will end up completely covering the lettuce and blocking it from the sun. Although, now that I think about it, that might be good since it warming up, and the lettuce needs to stay cool. I have a feeling, though, that it would just turn into a big mess--plus the weeds have surrounded the onions as well, and that is not good. I may end up having to hoe up this entire row and feed it to the chickens (nothing goes to waste around here! ), but I am still not thoroughly convinced that this was a lousy plan. I have two ideas. The first is to sow lettuce seeds over the entire space between the onions rather than in a row, leaving empty soil on either side. 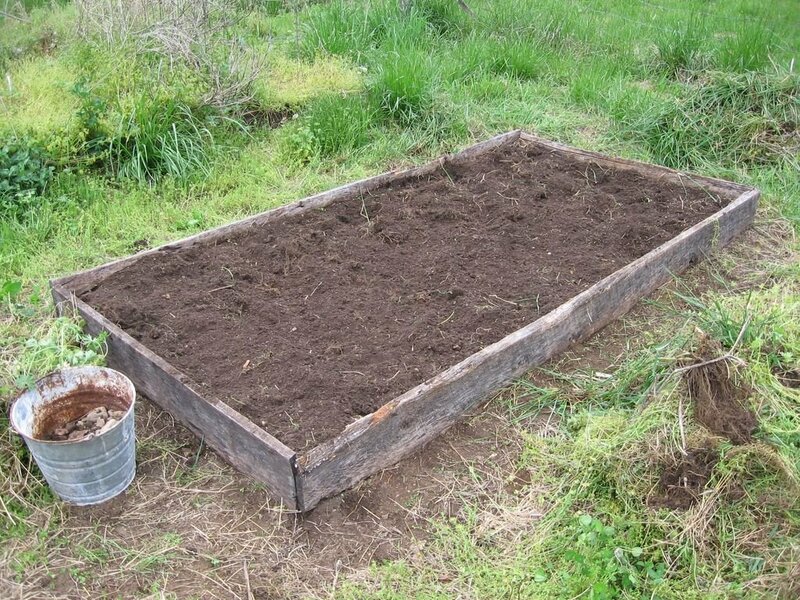 Then it would look more like this practically weedless lettuce bed. I'm actually surprised I didn't do this in the first place. The second is to try a different variety of lettuce--something taller and less compact. I'll also be mulching that entire row (before the garlic even sprouts) with grass clippings. So already there are some new turns in the plan. And we certainly aren't finished yet. It will be interesting to see what transpires in this plot as the weeks go by. Note: I'm embarrassed to admit this, but after looking at these photos, I think I may have the beet varieties backwards. My notes say otherwise, but it seems like the Bull's Blood would be the ones with the more reddish leaves, since they turn quite purple eventually. I also remember getting a bit turned around when reading my original planting notes (I have a little trouble with north, south, etc.). And here I thought this garden blog would solve all my record keeping problems! 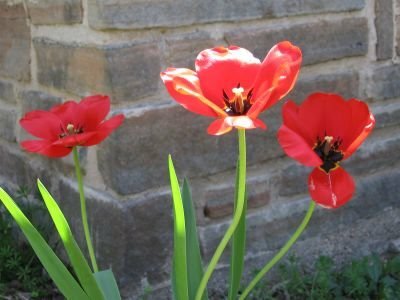 It is incredibly easy to rationalize the purchase of perennials when you are supposed to be out buying groceries. 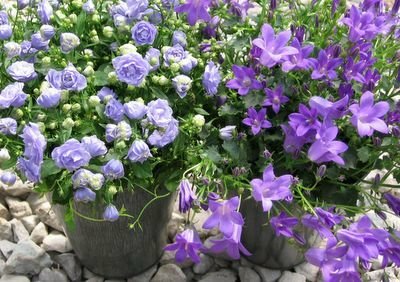 Simply remind yourself that this $6 campanula will most likely last for years in the garden--but that $6 worth of cheese will definitely be history in a week. --We've had 1-1/4 inches of rain, and everything in the garden is taking off like crazy. --I sure grow some extremely healthy weeds. 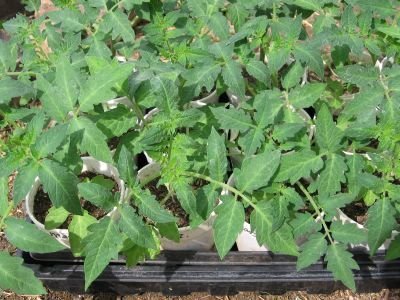 --Put some of my favorite Kellogg's Breakfast tomato plants into the ground yesterday (From the Baker Creek Heirloom Seeds catalog: "A giant, beautiful, orange beefsteak preserved by our friend Darrell Kellogg, a railroad supervisor from Redford, Michigan. The fruit are very flavorful and superbly sweet! This delicious heirloom is from West Virginia.") There is something about orange tomatoes--they are always so sweet. And the color! The Orange Banana tomatoes will hopefully get planted today. They were certainly a pleasant discovery a few years ago. Amazing flavor. --Stuck a few dozen more garlic cloves into the ground as part of my Late Spring Green Garlic Plan--around the edges of one tomato bed and between the onion rows where the lettuce didn't come up. Realized that unless the garlic grows at a much faster rate than the tomato plants, it will soon be obliterated from the sun, so I nixed the idea of a ring of garlic around each tomato plant. 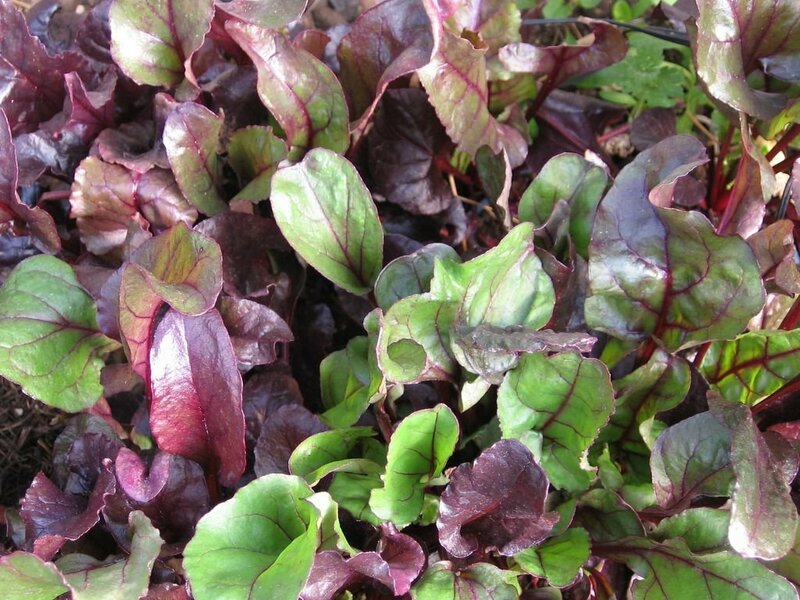 --Bull's Blood beets in greenhouse already going to seed. Always seems to happen so quickly--one minute something is ready to eat, and the next day it's heading toward the sky. (Reminder to self: there is no holding pattern in the kitchen garden--use it or lose it.) Will let them go and hopefully have some great seeds for next planting. I may be a tiny bit obsessed about salads. But there are certain times when absolutely nothing else (not even chocolate) will satisfy except some freshly picked baby butter lettuce from the garden. Even if it is 1:30 in the morning. And we're in the middle of a thunder/lightning/wind/hail/rainstorm. And my terrified, thunder-phobic dog is trying desperately to climb into my arms as I crouch down harvesting lettuce in the dark and rain with a 98% dead flashlight. But oh, how that salad hit the spot. 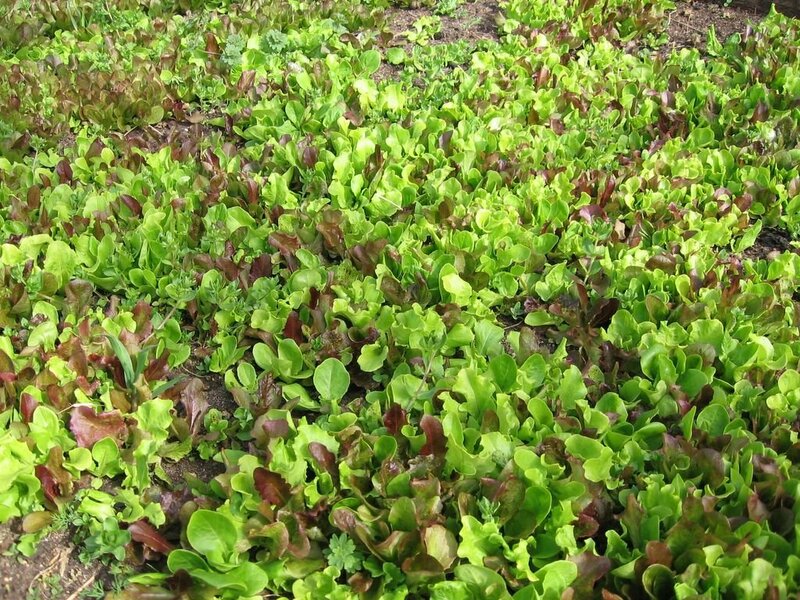 Harvest lettuce as close to mealtime as possible. Wash gently, spin dry. Find the biggest bowl you can, and fill it with your beautiful bounty. Toss in a handful of organic garbanzo beans (chickpeas) and a few cracked green olives. Toss lightly with a vinaigrette made with extra-virgin olive oil, white balsamic vinegar (proportions are entirely up to you), plenty of real dijon mustard, good garlic and onion powder, and salt and pepper (or freshly chopped garlic and shallots if you have the time and energy and really feel like swooning). Top with plenty of coarsely grated pecorino romano cheese. Find a fork and dive in. May be enjoyed anytime, day or night. This is what you get if you can convince someone who views the entire farm as a mowing challenge not to mow over the large patch of stuff in the yard that definitely isn't grass. Ate the first two stalks of asparagus last night, but they didn't even make it into the kitchen, let alone to the table. Nope, I munched them down right there in the garden. Ahhhhhh. --Even a light rain can really make a difference in the garden. Still needing to water every day, though, especially newly transplanted tomatoes and peppers. --Aconcagua pepper plants are thrilled to be in the ground and are taking off already. 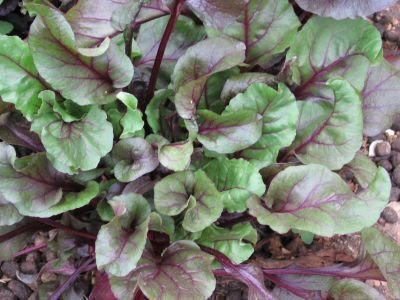 --Have been so in love with the first spring lettuce salads that have been neglecting to eat the gorgeous Swiss chard in the greenhouse. Larger plants have already started to bolt, but there are dozens of tiny volunteer seedlings still coming up. I don't know what I'd do without my year round chard harvest. --Just saw the first hummingbird of the season--in the greenhouse. --Yesterday saw the second snake of the season (cannot remember what kind off the top of my head but about two feet long and not poisonous)--fortunately not in the greenhouse. (Smaller snakes more than welcome to take up residence in there.) Haven't started seeing the copperheads yet which is nice. --Last night saw the second large garden toad of the season (or frog--must really learn more about these wonderful, insect devouring creatures)--unfortunately not anywhere near the greenhouse, but several hundred feet away in a lamb bonding suite in the barn. First one was in the barn, too. Think baby lambs must be catching and playing with them like all little kids do. Click here to see a photo. My bread baking buddy, Kevin, at Seriously Good in Tennessee, is on an asparagus rampage (and really, who can blame him?). Click here for his mother's mouthwatering recipe for Asparagus Parmesan and to read the interesting history of what I believe is one of the most sublime foods on earth. Then click here for information about Kevin's "Asparagus Aspirations"--a weekly roundup going on now through May of asparagus recipes submitted by asparagus loving food bloggers everywhere. Yum. I am amazed, astonished, fascinated, and in absolute awe--by the incredible beauty of this plant, and by the fact that it was created from one tiny beet seed. 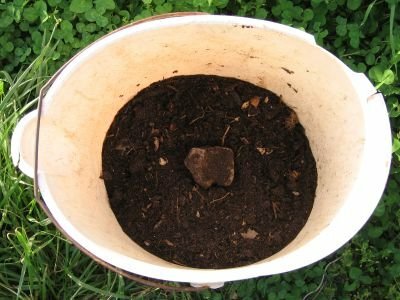 Rocks do not compost well. --13 of my favorite sweet red peppers, Aconcagua. Seeds saved from my best peppers last year, originally purchased from Baker Creek Heirloom Seeds, who says that they are "very large, long frying peppers up to 11" x 2-1/2". Tall plants give good yields over a long season, and the fruit is very sweet and delicious. Named after Mt. Aconcagua in Argentina." 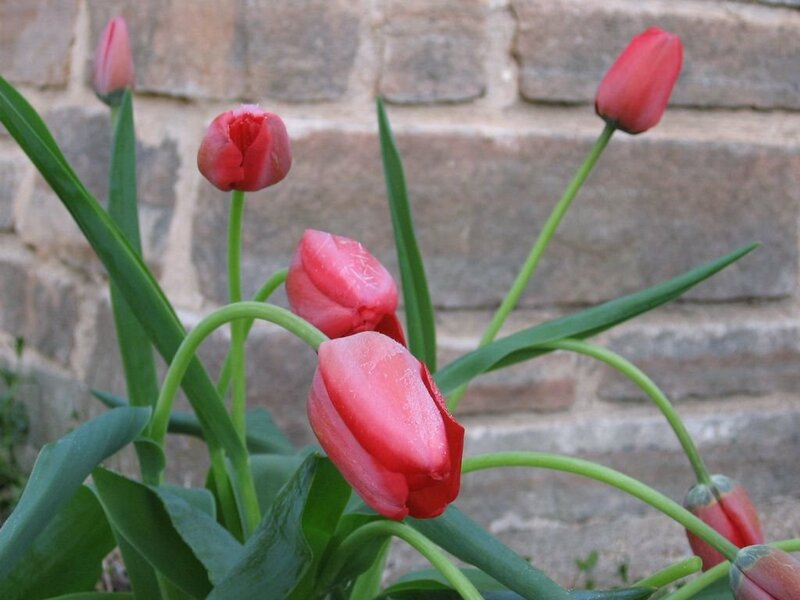 Click here to see some of last year's beauties. --Since raised beds topped with thick layer of manure/barn hay (yes! ), dropped a large scoop of compost into each planting hole just to make sure tender roots didn't get burned. Can't believe I never thought to do this before (probably because root burn has never been a problem), as it should be very good for the plants in general. --Glad I covered new plantings last night as temp was 48F this morning. --Spotted first grasshopper of the year hopping through my newly planted tomato bed. --Spotted definite mole damage in the onion bed. Young volunteer garlic: surprise gourmet food right under my hoes. 2013 Update: Love garlic? It's easy to grow, even in containers. 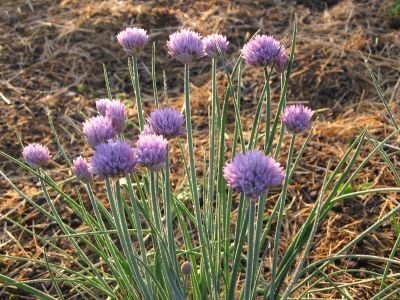 Learn How To Grow Your Own Garlic here. Last week I received an email from Catherine at Albion Cooks saying that she had just made another batch of my Savory Cheese & Scallion Scones, but this time she substituted cheddar and green garlic for the feta cheese and scallions. Green garlic? A quick pop over to her site revealed a lovely photo of the item in question, a delicious looking batch of scones, and the nagging feeling that I'd just read about green garlic somewhere else. But where? Oh, wait. Everywhere. 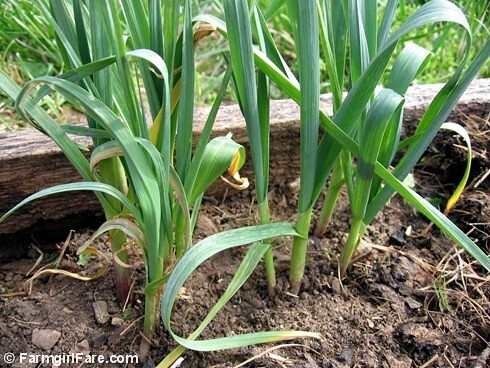 There were green garlic growing instructions from Veggie Gardening Tips. Then the little bit of green garlic history and a great photo, along with a recipe for Catalan-Style White Bean and Green Garlic Tortilla at In Praise Of Sardines. Mariquita Farm had another beautiful photo of green garlic, along with numerous tips on ways to use green garlic, plus several green garlic recipes, including green garlic mayonnaise, green garlic soup, and step-by-step photos of how to make green garlic pesto. This stuff really is everywhere. And those are just the ones I remembered. So what is green garlic, and how had I lived this long without knowing about it? Green garlic, also known as spring garlic, young garlic, baby garlic, and garlic shoots, is, claims Catherine, "a culinary secret." 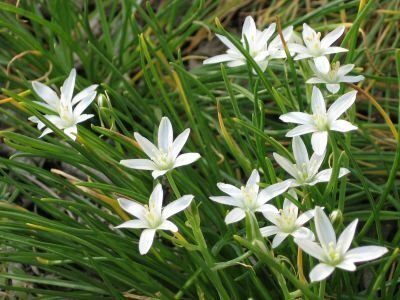 It is "immature garlic that hasn't yet developed its garlic bulb and has a much milder flavor than the mature bulbs, yet still has that distinct garlic flavor." What do you do with green garlic? "It can be used in any recipe in place of regular garlic or leeks, and can be used raw or cooked." And, obviously, it can take the place of scallions, too. Green garlic is also a market gardener and small farmer's (and backyard gardener's!) dream crop, as you can grow it in what would otherwise be unused space. I can stop worrying about getting the broccoli planted. I do this every year. I start seeds too late (well, I didn't think February 28th was all that late), they sprout but take forever to set true leaves, and then by the time they do, they've been all but forgotten in the hustle and bustle of other garden activity. So here it is April 19th, temps are in the 90s, and not only have my crowded broccoli seedlings not yet been transplanted into individual plugs (I did have them moved onto the potting bench--slight progress), but I obviously forgot to water them yesterday afternoon. So why do I torture myself year after year? Because I absolutely adore broccoli. And because once, many years ago, I grew two dozen heads of the most incredible broccoli I have ever tasted--and the memory refuses to fade. 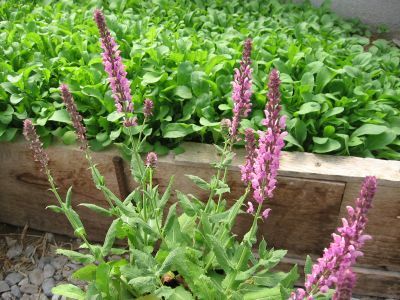 I've harvested a few heads here and there since then, and once I let the plants simply grow all summer, providing me with a few flowerets and lots of tender (and extremely nutritious) little leaves to toss into salads. I figure that someday everything will perfectly align itself just as it did that one glorious year, and my persistence will pay off. In the meantime, perhaps this will be the summer I remember to start broccoli seeds in August and transplant the seedlings into the greenhouse for a successful late fall/early winter crop. And to console myself, today I will enjoy a bowl of the delicious, oh-so-easy broccoli soup I created yesterday (with storebought broccoli, of course) which will be even more flavorful today. And as I am slurping it up, I will imagine how amazing it will taste when I am able to make it with my very own harvest. I like my soups pureed and very thick. Amounts are totally up to you, so you can easily make a thinner (or less oniony) soup if you like. Heat several Tablespoons of good olive oil in a large pot, then add lots and lots of coarsely chopped onions (I used four good-sized ones). Cook until onions are soft, stirring frequently, about 10 mintues or so. Stir in 1/4 cup of uncooked rice (this helps thicken the soup), then add about 4 cups (32 ounces) homemade chicken stock (or top quality storebought) and one large head of coarsely chopped broccoli. The soup will look too thick--it is not. Bring it all to a boil, then simmer with the lid barely cracked until broccoli is tender, about 20 minutes. Use a blender or hand immersion blender (I am deeply in love with my KitchenAid Hand Blender) to carefully puree the soup, then cook a few more minutes. Salt and pepper to taste. Serve, topped with whatever you like (chopped fresh chives, a drizzle of olive oil, some coarsely grated pecorino romano, dollops of sour cream, a slice of cheddar cheese) or absolutely nothing at all. While devouring, feel grateful for the existence of something as wonderful as broccoli--no matter where it comes from. Three varieties of half dead heirloom broccoli seedlings. Today, tomorrow, and Friday are third quarter fertile days: perfect for planting things that grow underground (like potatoes and garlic) and doing any kind of transplanting. There is no holding pattern in the kitchen garden. If you do not harvest your bounty when it is ready, it will turn into something else (or rot). At least in this case, I traded my uneaten turnips for cheerful flowers dancing in the breeze and plenty of seeds for my next planting. Yesterday Laura Goldberg, Director Of Communications at AOL, alerted me to an AOL Research & Learn article she thought might be of interest. "It takes a look at 'green' gardening," she said. "Not the color green, necessarily - but 'green' as in environmentally sound, and 'green' as in saving money. 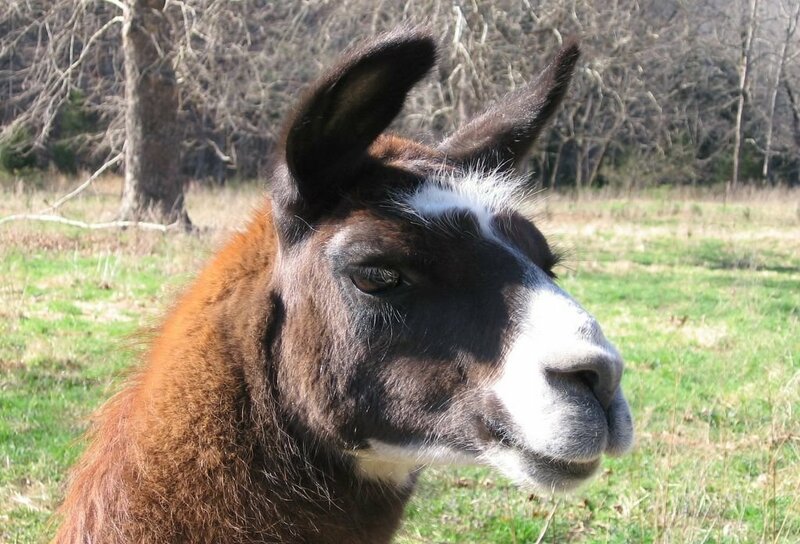 One of the suggestions: renting goats to get rid of weeds and overgrowth." Okay, she got me with the goats. 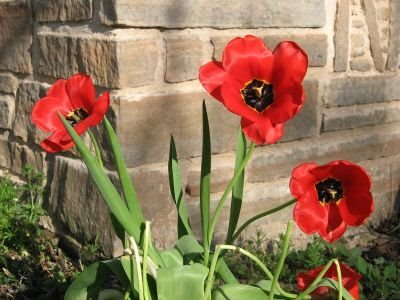 The article, entitled "Green Yards: Go Natural And Save," discusses such things as using native plants in landscaping, mowing with solar power, incorporating Integrated Pest Management (IPM), and, yes, grooming your yard with rented goats. Plenty of helpful links, including six to "green" blogs, can help get you started. And the goat story is a riot. But since you know I'm partial to sheep, I feel it only fair to mention the goats' competition. Obviously concerned that all the new lambs on my farm were not earning their keep (I believe her actual words were, "You can put those little guys to work! "), B'Gina at Stalking The Waiter recently told me about Wooly Weeders. Now how can you not love a company whose slogan is "Noxious Weeds Are Our Specialty?" Apparently these folks provide an "environmentally sensitive mowing service for vineyards and open lands." Hmmmm. I helped plant over 600 grapevines on the farm I lived on before I moved to this one. Perhaps I should contact the new owners and see if they'd like to rent my mowing/weeding/fertilizing woolies for a while. . . This is the best looking lemon balm I've ever grown. For the most part, my herbs never do nearly as well in pots as they do in the ground, which is where I've been planting (and replanting) my lemon balm for years. It often disappears over the winter. 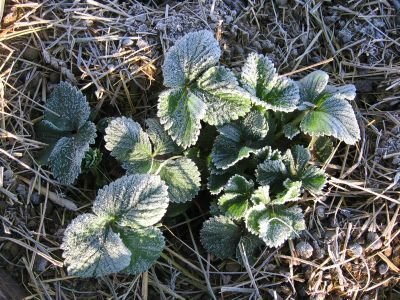 Since lemon balm is easily started from seed, this was not such a big deal. But now that I've finally figured out the secrets (grow it in pots that are overwintered in the greenhouse and fertilize with plenty of sheep manure tea) I see a bit of extra time on my hands—and some newly available space in the garden. I did spot one fairly good looking specimen coming to life in what I am now referring to as the echinacea bed today, so perhaps I'm wrong, and this is just a good year for lemon balm. No matter what, the stuff in the pot looks fantastic. According to the wonderful book Rosemary Gladstar's Herbal Recipes for Vibrant Health: 175 Teas, Tonics, Oils, Salves, Tinctures, and Other Natural Remedies for the Entire Family (400 pages; paperback; just $11.53 at amazon.com), lemon balm (Melissa officinalis) is a beautiful and fragrant member of the mint family and one of nature's best nervine herbs. 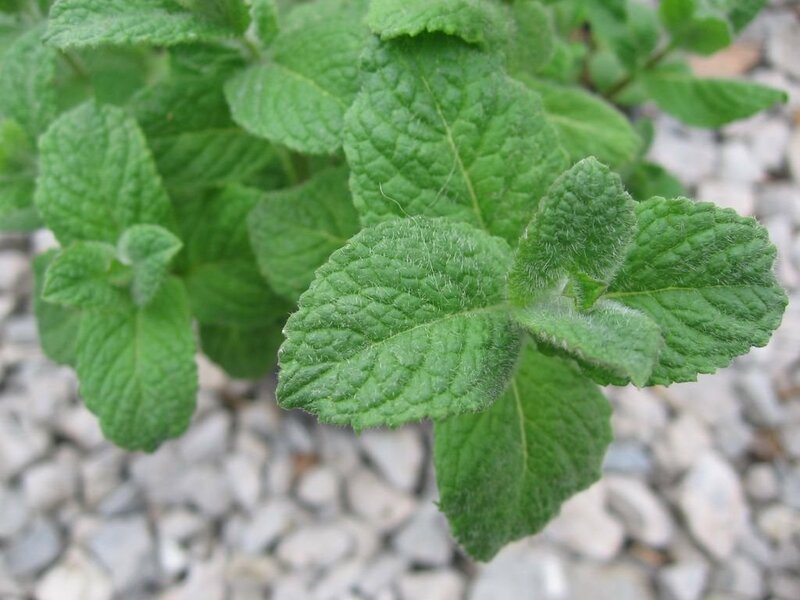 Lemon balm's leaves and flowers contain volatile oils, tannins, and bitters that have a definite relaxing, antispasmodic effoct on the stomach and nervous system. 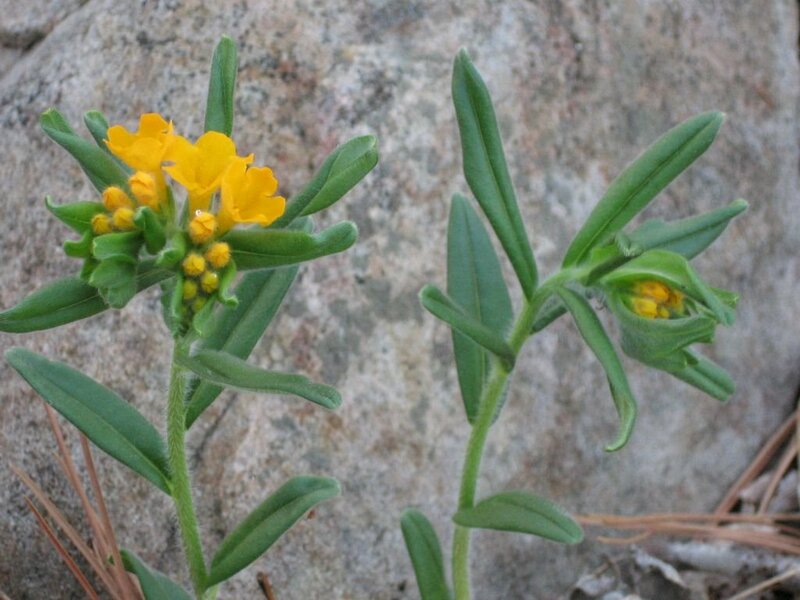 It is excellent for stomach distress and general exhaustion and can be used as a mild sedative and for insomnia. 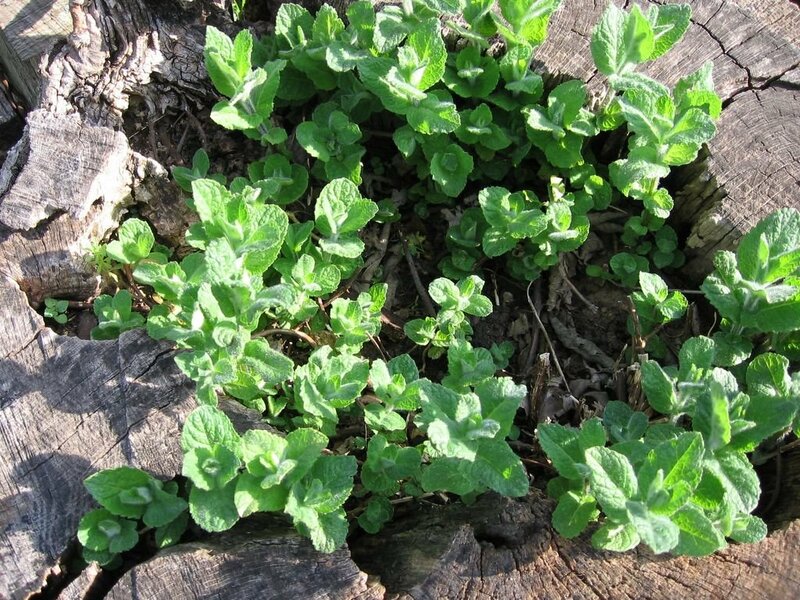 Applied topically, lemon balm has been found to be helpful for herpes. It is often made into a cream for this purpose, though I find that the tincture works as well, and the essential oil is the treatment of choice in European countries. 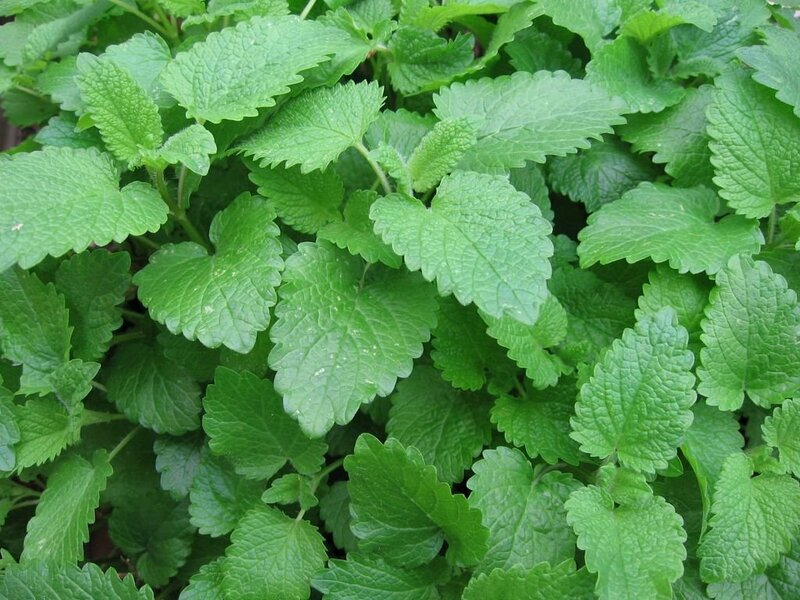 Fresh lemon balm is most effective for medicinal preparations. It makes a delicious tea and can be served with lemon and honey throughout the day to alleviate stress and anxiety. For a delicious nervine tonic, blend equal amounts of lemon balm, oats, and chamomile. Making a pot of lemon balm tea requires nothing more than picking a handful of fresh leaves and pouring boiling water over them; steep in a teapot or covered cup so the beneficial elements do not escape with the steam. I also like to toss a few leaves in with other types of tea, like the Celestial Seasoning's Tension Tamer I've been drinking for 25 years. It's also easy to dry your own lemon balm. Since our high humidity most of the year often inhibits successfully drying herbs, I usually wait until the colder months to preserve my harvest. I simply put the lemon balm in a brown paper bag, seal it with a clothespin, and place it on a high shelf near the woodstove in the living room. The best time to harvest most herbs, including lemon balm, is early in the morning when the oil levels in the leaves are highest. You can even add lemon balm to baked goods, though I have yet to try this. My favorite thing to do with it? Pinch off a few leaves, rub them between my fingers, and inhale deeply. So lemony, so calming, so lovely. 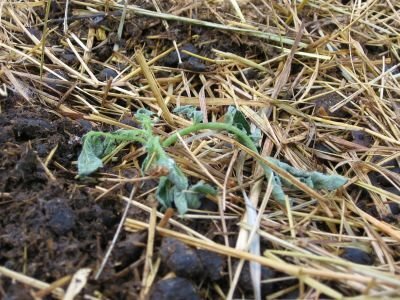 --Potatoes survived that last frost and are re-sprouting through the thick layer of sheep manure/shredded hay mulch I gave them. --No sign of mache seeds sprouting in raised bed with kohlrabi. Need to clear out healthy weed crop and replant something else there. --No sign either of Lutz Winter Keeper beets and Amish Deer Tongue lettuce companion planted in the onion plot. (Not surprising about the lettuce, as I recently realized these were the same 2004 seeds that didn't come up when I started them indoors. Despite what many authorities say, I find that lettuce seeds rarely last more than one year.) Weeds are coming up well instead. Need to decide if I want to sow other seeds or just mulch between the onion rows with grass clippings like I usually do. --Raspberries canes are leafing out nicely. Seem to get greener by the hour. 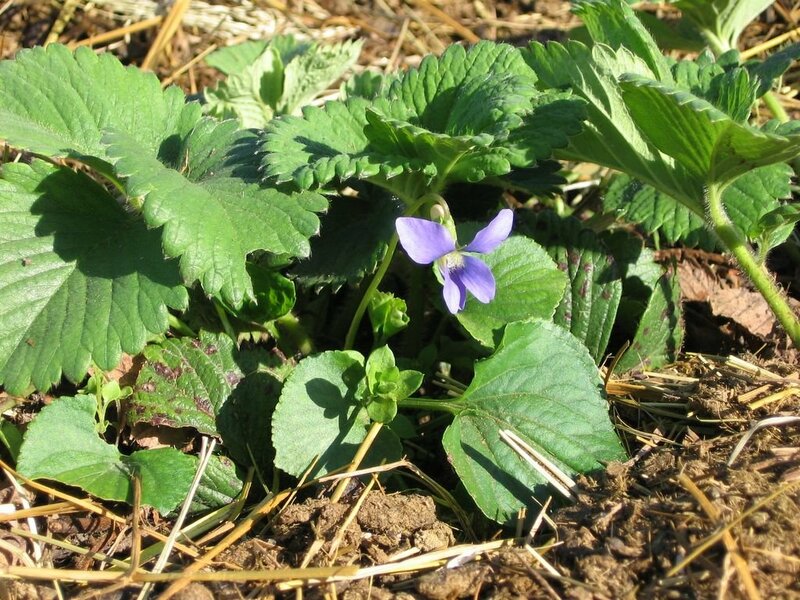 --Did a brief dig into the thick grassy weeds looking for boysenberry life. Didn't find any yet. Think raspberries are my best bet for berries here. Well, them and. . .
--Strawberry blossoms popping up all over! --10 San Marzano tomato plants seem happy in their new bed (that 11th one is definitely dead). --Chive blossoms are already poking out. —Get to that neglected asparagus bed—and fast. Coming Up: These new posts are now up! —Growing Dragon Langerie (Dragon Tongue) Bush Beans: of my favorite heirloom bush beans. I'll be planting my first crop of beans on the fertile days in the next first quarter (April 28th, 29th, May 2nd, 3rd, & 4th). Will you? I have Garden Vision. When I am in my garden, what I look at and what I see are often not one in the same. Take the photo above for example. I do not see 11 itty bitty tomato plants that may or may not survive all that Mother Nature is going to throw at them. I see pounds and pounds of ruby red bounty just ripe for the plucking, plates of sliced tomatoes drizzled with olive oil and vinegar and dusted with salt, a bustling, steamy kitchen in the middle of shrinking down summer--even next winter's pizzas being slid onto a hot baking stone. But would anyone else? Who cares. I know what's coming. I know what I see. I have the vision. Click here to see how much they grew in just 10 days. That's the Magic Of Manure Tea, I tell you. Despite two new baby lambs and an unexpected little rainstorm yesterday (all welcome diversions), I did manage to put 11 ecstatic San Marzano tomato plants (started from seeds I saved from my best 2005 tomatoes) into a raised bed. Well, I know that I was ecstatic at least. In fact, I was so excited about just getting some tomato plants into the ground that I completely forgot about hardening them off. That's right. My spoiled seedlings went straight from greenhouse to garden. Talk about a culture shock. Ten minutes in the ground and they were already starting to wilt. Oops. At least I buried them up to their little necks--and there were only three hours left until sunset. So in a perfect garden, this is what happens. First you harden off your plants. This simply means setting them outside for progressively longer and longer periods each day (starting with only an hour or two) so that they can begin to experience the harshness of life in the great outdoors--sun, wind, rain, little bugs, big marauding dogs and cats. When you are ready to transplant, do it on a cloudy, fertile day in the third quarter (April 19th & 20th this month). There are two schools of thought on fourth quarter gardening. 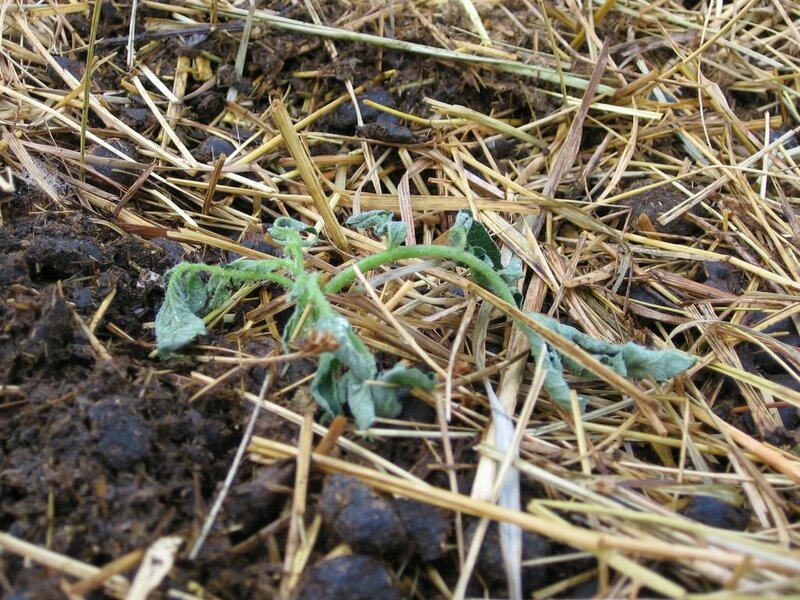 Some believe that it is a bad time to do pretty much anything but weed or mulch. Others treat it the same as the third quarter. 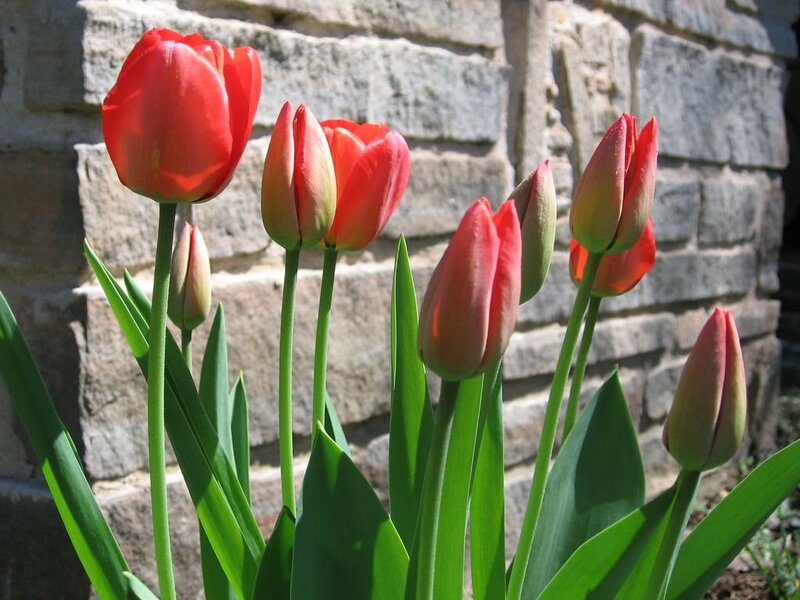 (Fertile fourth quarter days this month are April 24th and 25th). And then there are those of us who wish we'd never learned about this minding the moonsigns business because now we're completely paranoid about doing something on the wrong day. (I know, I know. I promised to explain more about it. Soon. But I'm warning you--you probably don't really want to know.) If cloudy weather is not in the forecast (yes, that's sun shining brightly on my plants in the photo), wait until late afternoon so they'll at least have all night to settle in. As I mentioned in a previous post, you then need to put your faith in me and pinch off all but top two or three leaves of each plant. to this. But roots will shoot out of each of the pinched parts, and this will make your little plants strong and happy. Then you carefully place each plant into a hole in which you have sprinkled 1 teaspoon of epsom salts (NOT table salt; find it in a bag or carton in the pharmacy section). There is a scientific reason for doing this, but I don't remember what it is. I promise you it helps, though. Water each of the seedlings very well, and cover them with something (a cloche, a floating row cover, an old bedsheet, a bucket) if overnight temperatures are expected to go below 50F. Then stand back, take a look, and see what you can see--and pray to the garden gods if you're into that sort of thing. And remember to always keep a few replacements at the ready (because even I can see that this poor plant is exactly what it looks like--nearly dead). 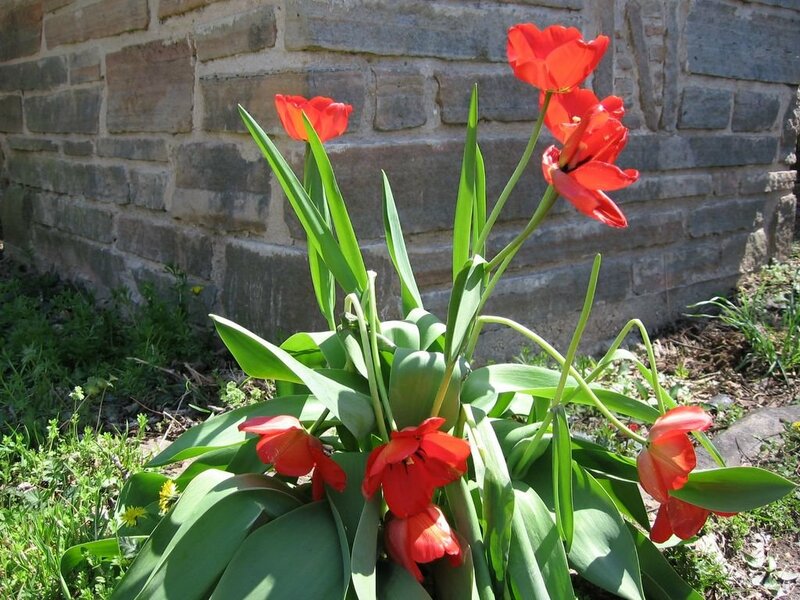 One little clump of tulips in the front yard can create as much joy as entire field full of them. Sitting inside one's greenhouse during a rainstorm has a wonderfully soothing effect - even if it does mean that all of your big transplanting plans for the day have been scrapped. And the once dry laundry on the clothesline is now soaked. That's okay. Just focus on the lulling sounds of the raindrops washing all those little thoughts away. And besides, we really need the rain. I've had plenty of crazy thoughts over the years, but believing I'd actually killed the mint has got to be near the top of the list. Last night's micro mesclun salad was by no means miniscule. I carefully plucked a whopping 22 ounces of itty bitty lettuce leaves out of the raised bed plot yesterday, and you can hardly even tell. I suppose this is a good thing. (If you've never weighed baby lettuce before, I urge you to go set some on a scale right now. Twenty-two ounces is a lot of little leaves.) My dainty dinner salad was enormous. Actually, it was dinner. And so easy to prepare (well, after all the picking was done). The greens were so delicate I cleaned them by placing them in a large bowl of cold water and gently swishing them around. Drain, repeat, then dry in salad spinner. (These things are fantastic. I bought mine from Pinetree Garden Seeds several years ago for under ten dollars, and I love it). My tender bounty (to which I added a handful of baby arugula from the greenhouse) required nothing more than a splash of the simplest olive oil/white balsamic vinaigrette and a generous sprinkling of coarsely grated pecorino romano. It was divine. And there is plenty left for a second serving tonight. Take A Look At. . .
"You might be interested in Kitchen Gardeners International, a fledgling international movement for dirt-y minded food lovers. Our goal is to get people growing and cooking some of their own food again. I’d love to have your support in whatever form that might take." Kitchen Gardeners International (KGI) is a new non-profit network whose mission is to celebrate home-grown, home-made foods in their many global forms and to promote their role in building a healthier, tastier, more sustainable and secure food system. In doing so, KGI seeks to connect, serve, and expand the global community of people who grow some of their own food. The idea for Kitchen Gardeners International was planted by a diverse group of kitchen gardeners who believe that food is central to human well-being and one of the best ways of uniting people of different countries and cultures around a common, positive agenda. It is registered as a 501(c)(3) public charity and governed by a volunteer board of directors with representatives from the United States and Europe. Our network of friends and supporters now includes over 2200 kitchen gardeners from 45 countries with new ones signing up each week. --To promote cultural exchange and international understanding via a shared love of kitchen gardening. Heat is the bitter enemy of lettuce. 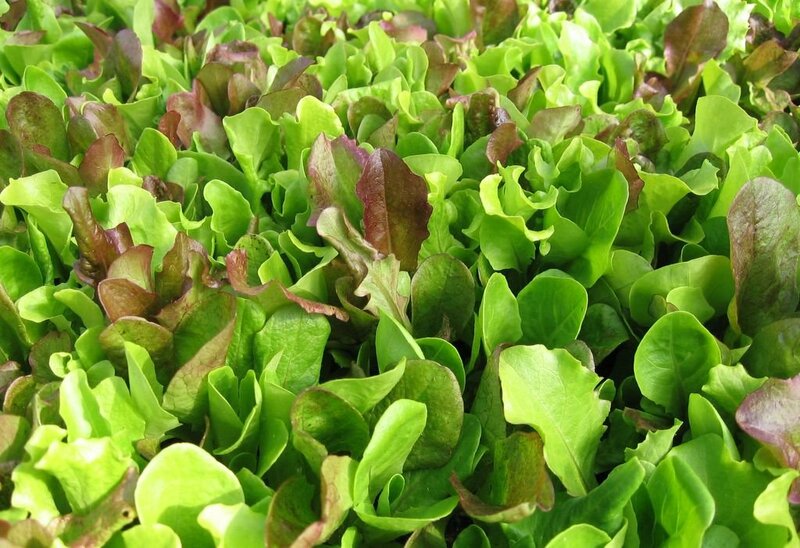 Want to grow your own lettuce? 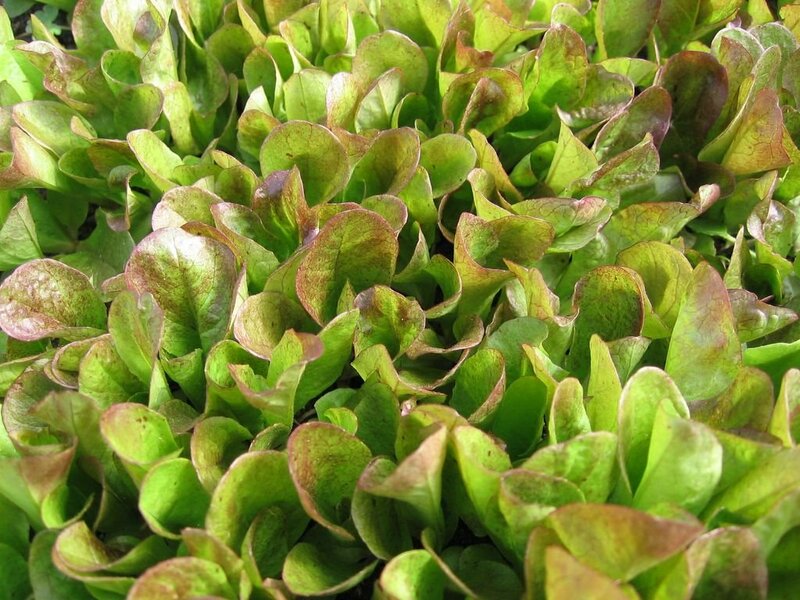 Check out How To Grow Your Own Gourmet Lettuce from Seed - It's Easier than You Think! Our weather is unpredictable year round—and from each year to the next—but one thing is certain: there is always at least one heat wave in April. A few days in the upper 90s are not uncommon. With soaring temperatures (88F Wednesday, 91°F yesterday) and more predicted through the week, I realized it was already time to shade the lettuce bed. Just a few days of extreme heat can transform your entire crop of lovely lettuce into bitter greens—and send it bolting skyward with nothing but seed making on its mind. Even a little bit of shade can make a big difference for nearly all plants. Full sun is harsh. If the thermometer reads 90°, a plant or person standing out in the sun for any period of time is going to feel much hotter than that. Several years ago I read about a couple who had quit their jobs at a large newspaper, moved to the country, and created a wildly successful small farm business. They sold their bounty at a farmers' market and through weekly subscriptions (conveniently to all of their former colleagues—one delivery stop and they were done). 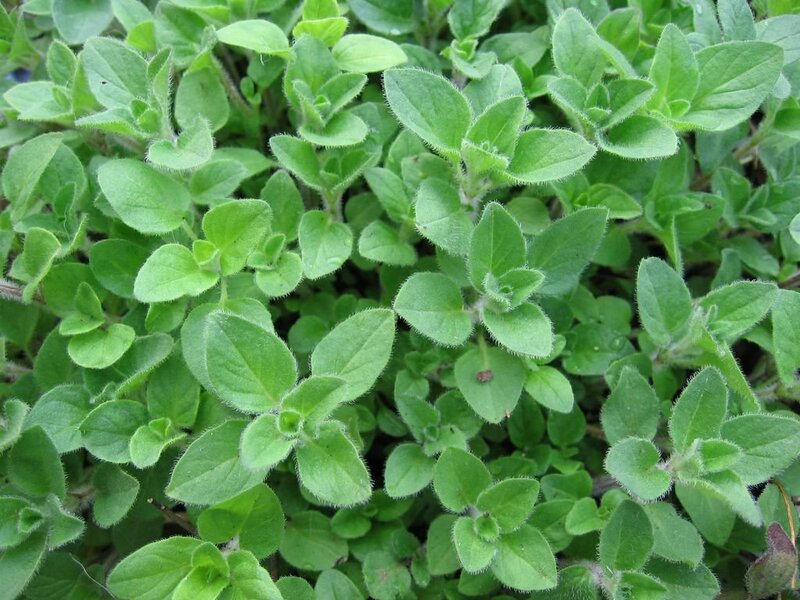 One of their most popular crops was basil, which does just fine in the heat. So when this couple spent $1,400 constructing a greenhouse solely to house their summer basil plantings, people thought they were nuts—until they saw the results. The greenhouse basil was bigger, healthier, and tastier than what they had been growing in direct sunlight. Soon I'll be tying an inexpensive, blue plastic tarp over the top of my greenhouse to keep the interior temperature down. Click here to see a photo. I also keep the door open and back side vented. Even with the tarp on, plenty of light still reaches the plants. The raspberry canes growing on the south side also create shade and help cool things down. Some people roll up the sides of their greenhouse plastic in summer so the air can flow through, which is what I plan to do with my next greenhouse. Others remove it entirely and replace it with shade cloth. But back to the lettuce, which I don't plant in the greenhouse in spring because even now it's already too warm in there. 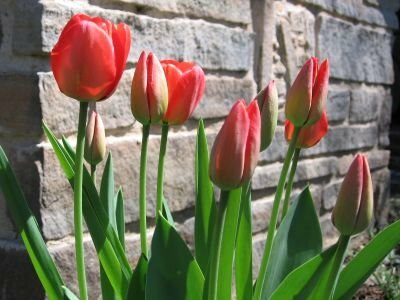 Creating indirect light for your plants using a greenhouse, shade cloth, or by simply growing them in a partly shaded spot can make all the difference. Just think of how well everything grows in mostly cloudly places like England and the Pacific Northwest. Cooling down your heat hating lettuce can literally save or extend your crop. You can buy fairly inexpensive rolls of weather resistant shade cloth in garden centers and nurseries or by mail order. Or you can poke around the house/garage/basement/neighbor's yard and see what you already have hanging around. Old bedsheets (check thrift stores and yard sales) offer many of uses in the garden, including as shade makers. Clip them (clothespins work) to bamboo stakes (or old broomsticks or your kids' hockey sticks or whatever you can find) stuck into the ground around your plot. Just remember to take them down if it rains. My 'shade cloth' in this photo consists of two strange curtains I found stashed in an old storage box. They still let in a fair amount of sunlight, but they also allow the rain to reach the plants so I can just leave them up all the time. And after three years out in the blazing sun, they haven't begun to disintegrate, which is a bit frightening actually. The obnoxiously bright but easy to spot plastic clips were purchased at a discount store on a whim and have come in very handy around the garden. 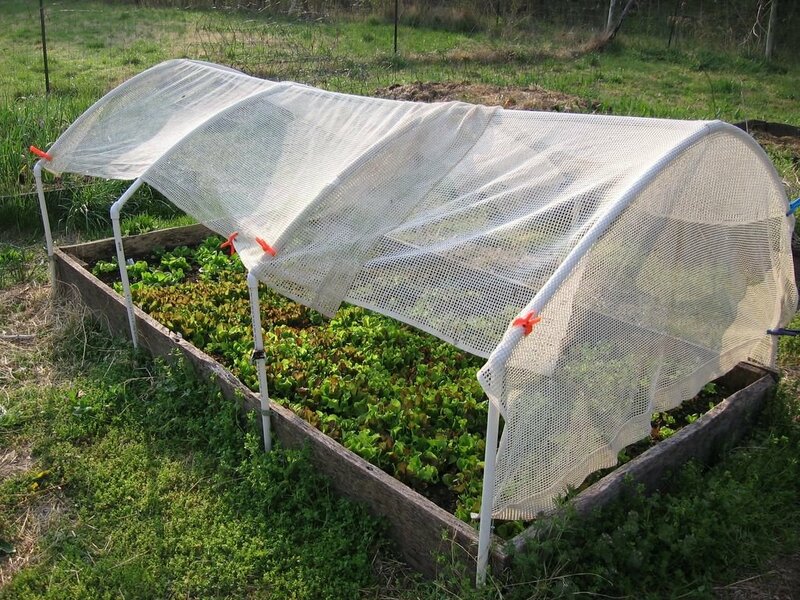 For more information about the mini greenhouse frame on this lettuce plot, please see the comments section in this previous post. Regular watering during hot days is, of course, essential, especially if you're growing in containers. 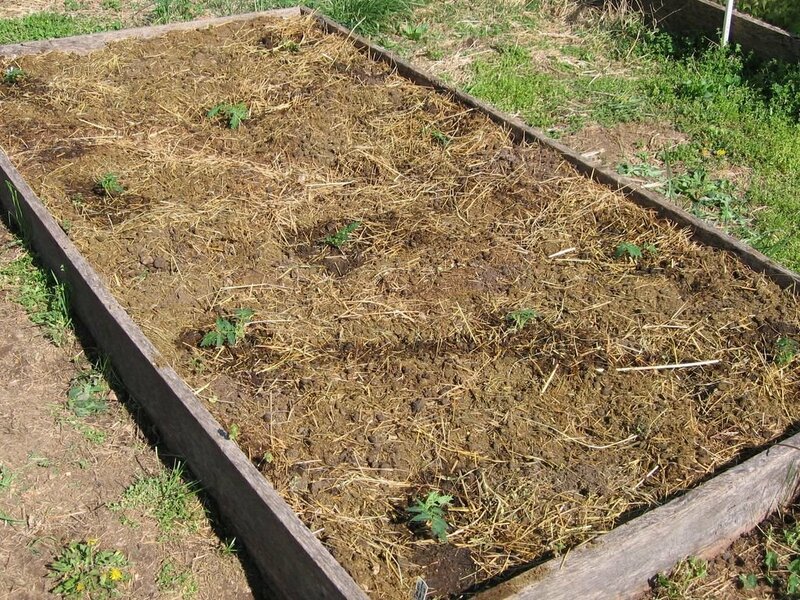 Raised beds also dry out faster than regular garden beds. Supposedly by the time a plant shows signs of wilting, it is already in extreme distress. 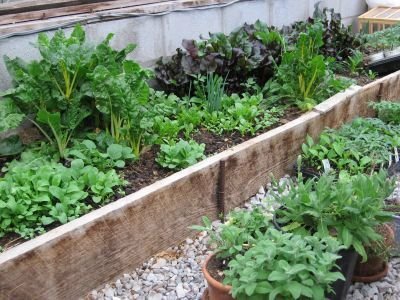 Note: Unless you live in the Southern U.S. or other warm climate, it's not too late to get a little gourmet salad garden going. Check out my post, How To Grow Your Own Gourmet Lettuce from Seed - It's Easier than You Think!, for inspiration and tips. --Just plucked the tiniest heart rock yet (1/2 inch high) out of the onion plot. It is darling. --The Dark Lollo Rossa lettuce seeds interplanted in the onion plot have sprouted. --The echinacea in the flower bed came up while I wasn't paying attention. There appears to be much more of it than last year. It is beautiful and I love it (and it attracts so many pollinators to the garden), but it is crowding out all of the other plants. Hmmmm. It does, however, require no maintenance and is extremely hardy. And that is good. It is obviously happy here. Decision made. It stays. --The echinacea has jumped stone bed barrier and moved into grass (make mental note to point this out to overenthusiastic Lawnmower Man) . --Record breaking temps yesterday. Record was 82F, now 84F (though I saw 88F in the shade on our thermometer). I really need to do some thinning. . .
Realization Of The Day: 150% germination rate is obviously possible. These lettuces (along with some Tom Thumb seeds from Pinetree) were direct seeded in one of my raised beds back on February 28th. They had a bit of a slow start due to the cold (and the fact that I didn't bother covering the mini greenhouse frame with plastic this year--see the comments section in this post for more on the mini greenhouses), but the main reason they are still so small is because they are simply too close together. They need to be seriously thinned, which just means pulling out some of the plants to give the others enough space to mature. Believe it or not, I did thin this plot once already. The delicate little plants are big enough to eat--so tonight I will dine on a miniscule micro mesclun salad. But if I'd thinned these seedlings a week or two ago, there would be lots more lettuce to go around. 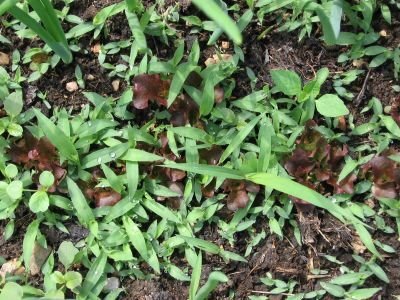 Besides bonus baby greens, another advantage to sowing lettuce seeds so thickly is that there is no space left for pesky little weeds to pop up. More on starting some salad greens hopefully tomorrow (to those of you who have been patiently waiting, I thank you). And the spring garlic planting info is coming up, too. If you don't have any nice heads of garlic hanging around, go out and find some. 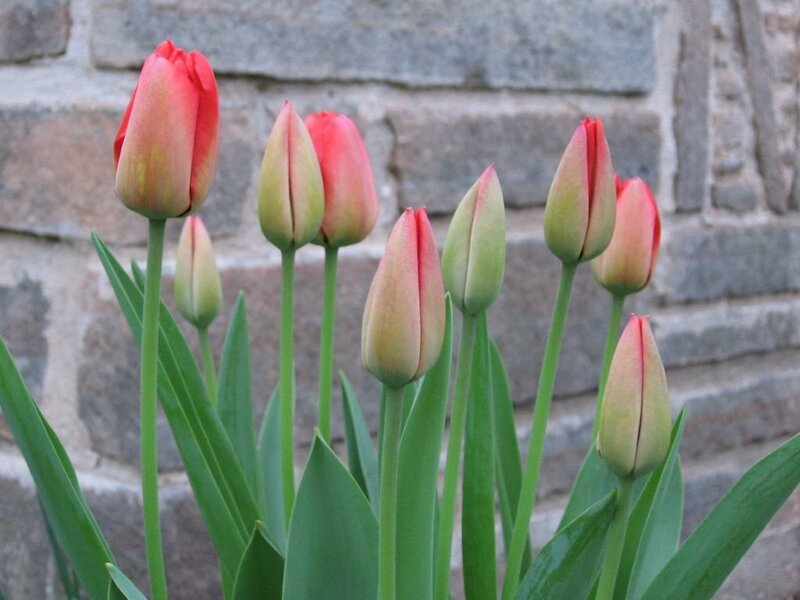 The planting days begin April 14th, and there are no excuses--you can even grow it in a pot. 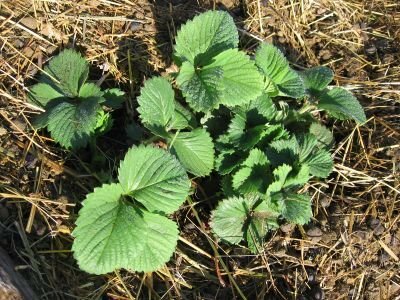 --Just spotted the first strawberry flowers (on the plants growing in the pathways around the old strawberry bed). --I think every single onion has sprouted. --Watered the planted raised beds today as it is 88 degrees and sunny, and everything is very dry. It was a little depressing having to water this early in the season, yet at the same I felt strangely guilty, as so many parts of the country are being deluged with unwanted rainstorms. Thinned purple kohlrabi seedlings--slightly frostbitten but still tasty to a chicken. I actually have more strawberry plants in the new bed than I previously thought. The few that survived sent out runners, and I found tiny plants hiding under the weeds. Now they are all nicely mulched with dry barn hay full of sheep manure (love that stuff--have six raised beds covered with it already), and the real count is 14 plants. They only fill about 1/3 of the bed (right now the rest has been taken over by tiny volunteer dill seedlings), so I guess I will not pinch back runners and just let them spread. That means no berries this year, but it will be worth it. I think. (Yes I know I keep promising more information about this, and I will deliver--really.) In the meantime, some fertile 3rd quarter days are coming up: April 14th, 15th, 19th, and 20th. There aren't usually four in one cycle so we are very fortunate this month, as these are the days we all need more of this time of year. The moon will be waning (and drawing things "downward") so they are the perfect time for transplanting (seedlings into individual plugs, seedlings into garden, potted plants into larger pots, etc.) These are also the days you want to plant things that grow underground, like potatoes and garlic (but not onions--those go in the 1st quarter, and no, I don't know why). In most places, it's not too late to start a little spring garlic. More about that very soon. It's always gratifying when our efforts in the garden are clearly visible. I did not start too many tomato plants. I simply do not have enough garden space. I need more raised beds. A lot more raised beds. --Friday I spotted two potato plants. Saturday I counted at least a dozen. This morning I found one. Seems the new little green leaves froze in the night. The plants should still be okay, though. But just in case I covered them with a thick layer of dry sheep manure/barn hay mix today rather than waiting until all of them had sprouted and were a few inches high like I usually do. Hopefully you can't overfertilize potatoes because that plot was full of really rich soil already. --The onions are coming up, and a few of the interplanted beet seeds have sprouted. No sign yet of the lettuces. --There are itty bitty volunteer dill plants practically covering two different beds. Yes! --The raspberry canes on both sides of the greenhouse have awakened and are bursting to life. Lots of spreaders coming up, too. 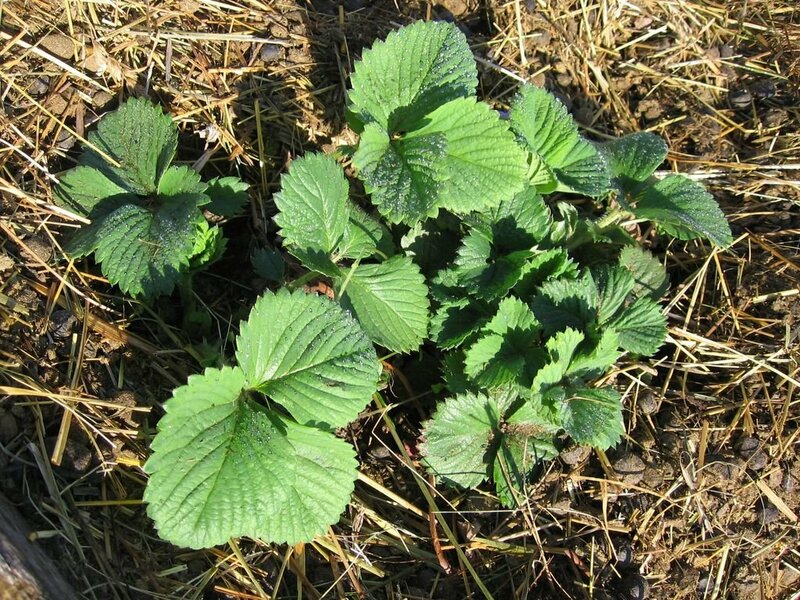 You can read more about my raspberry planting adventures here. 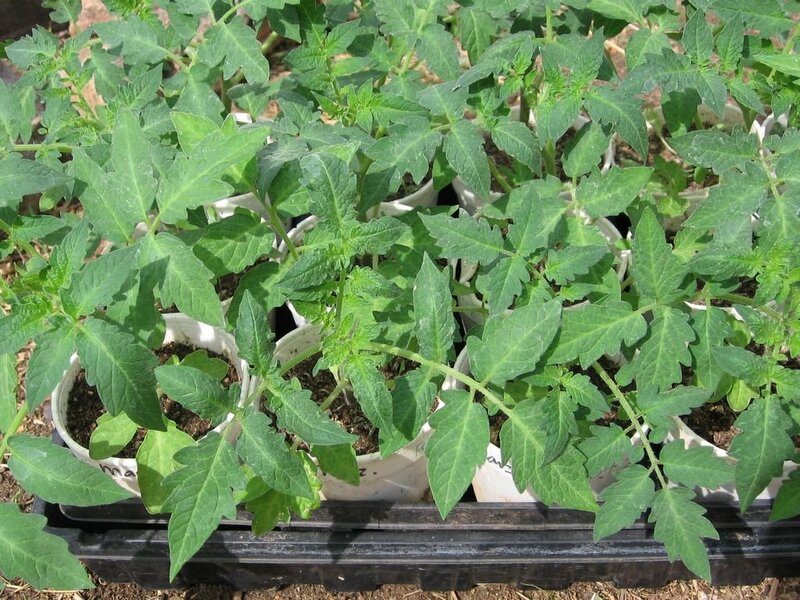 --The tomato seedlings in the greenhouse are just begging to be set free in the ground. And the pepper plants want out, too. Not yet! Not yet! Geez, look what happened to the potatoes. --The few strawberry plants that survived are doing nicely. Started with 24 locally grown plants bought at the Garden Club plant sale last spring, and I guess I let the weeds choke them out or something. (Not enough sun when they were small?) Down to maybe five or six plants. I'm going to go ahead and let them spread. Cannot bear to even look at the old strawberry bed, so full of humongous clumps of fescue that took over. It was delicious while it lasted--and the spillover plants that hopped out of the bed and into the walkways have promise (unless they "accidentally" get weed whacked). Note to self: Consider placing moratorium on all weed whacking activities in the garden unless I am available to closely supervise whacker. 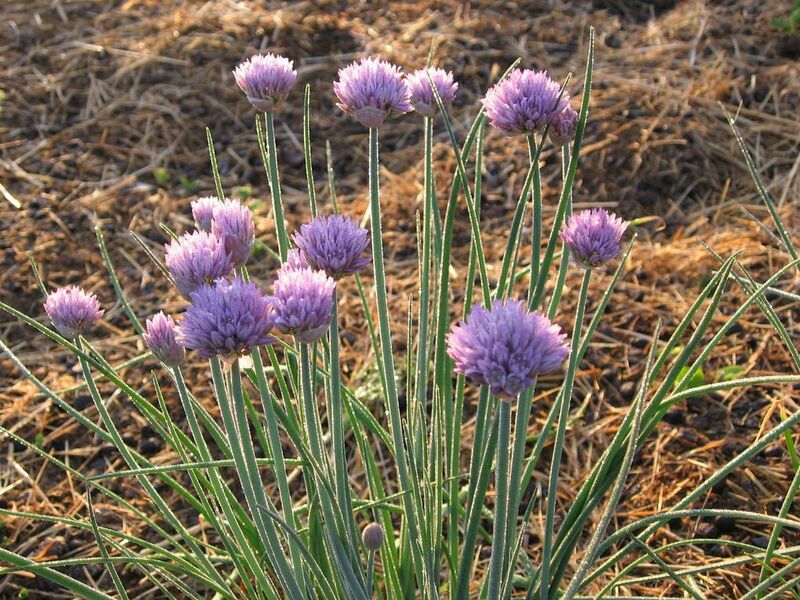 --Chives look fabulous. Really want to make some cheddar and chive scones (variation of this recipe). --Green Eggs: Fresh farm eggs scrambled with lots and lots of Swiss chard from the greenhouse and chives from the garden, sauteed mushrooms and chopped parsley (storebought) mixed in, sprinkled with Irish sharp cheddar, more chives, and topped with a dollop of organic sour cream. Good to go for several hours. --Greenhouse Salads: green chard, yellow chard (love those deep yellow stalks), baby arugula, purple beet greens, corn salad (mache). Plus golden turnip greens from the garden. --Latest discovery: Baby arugula mixed into the Green Eggs. Yum! --Luscious clover and big fat dandelion plants (roots and all) plucked from the walkways between the raised beds, last of the overwintered endive and escarole I found hidden among the weeds while clearing out that bed yesterday, gourmet micro mesclun greens (thinned out lettuce plot), golden turnip stalks and baby Spanish black radishes (more thinning). --Cut back dead raspberry canes and try to corral the live ones into some kind of order. 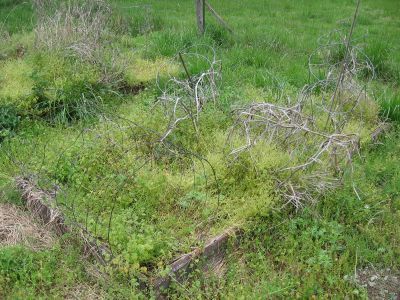 --Lavish lots of attention on the neglected asparagus bed, as asparagus shoots will hopefully be presenting themselves soon. 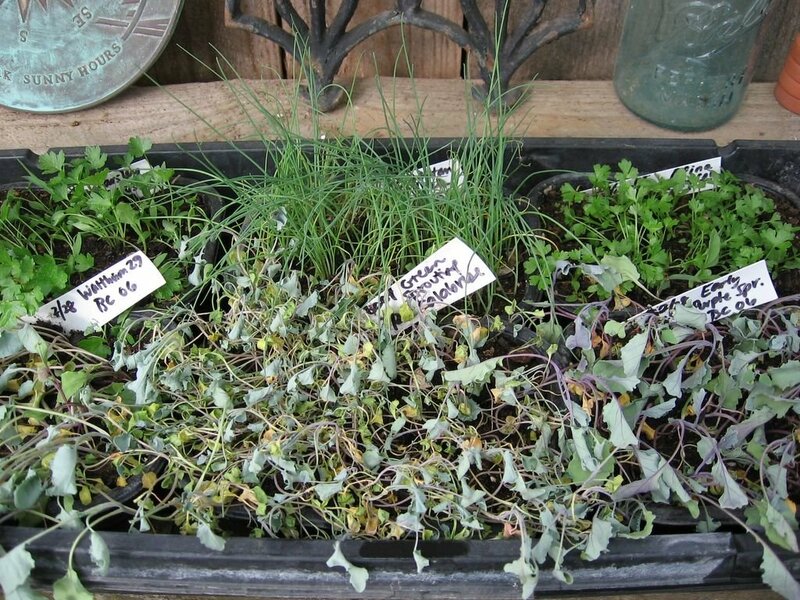 --Thin the tiny purple kohlrabi seedlings. --Thin the arugula lawn in the greenhouse. 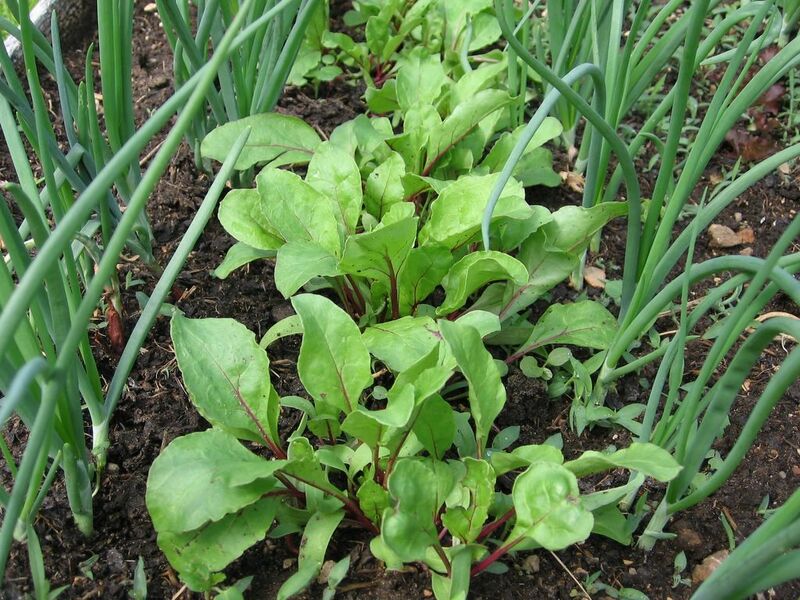 --Eat the mature arugula in the greenhouse! --Cut that giant yellow flowering thing way back before it takes over the entire flower bed. --Figure out which tomatoes and peppers are going to go where. 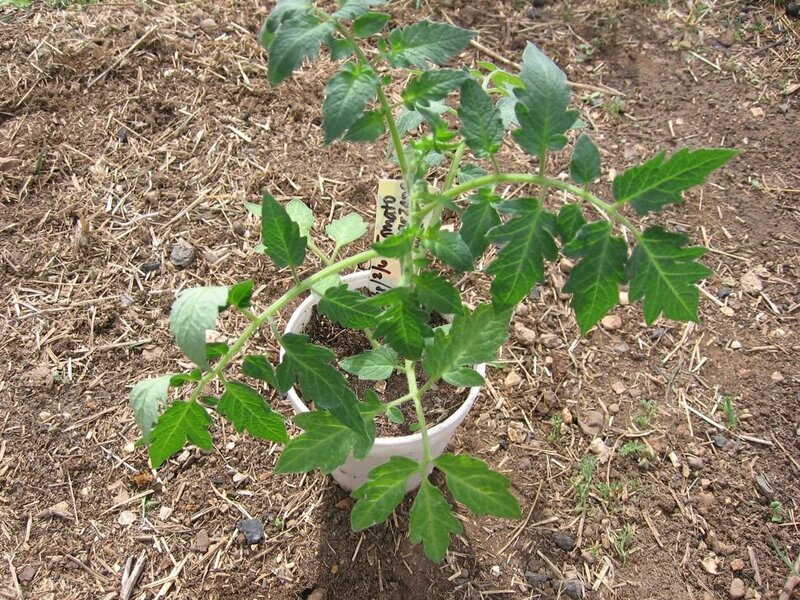 --Consider alternate planting locations for tomatoes--around compost bins, behind greenhouse, etc. Somewhere. Anywhere. I want my tomatoes! --Prepare bush bean plots and decide what varieties to plant where. Consider companion planting with something this year. 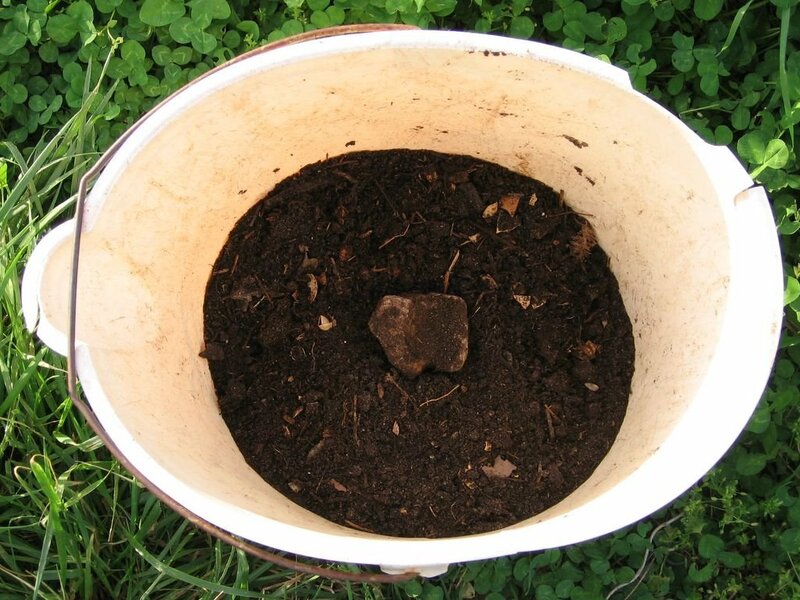 --Make up big tub of manure tea now that temps have warmed up and tea won't freeze solid and crack the tub. Two gallon mini manure tea operation in greenhouse has been working very well. --Not ignore this overwhelming list. I Can't Live Without. . . I've increased my empire. Click here to find out how. From Garden To Table (what I've been eating from the garden), Harvest For The Henhouse (sometimes it seems like my crazy hens eat better than I do), miscellaneous garden notes, and something new: Need To. . . (looks like the first installment is going to be quite a list). So check back later today if you're interested. And if you're still having trouble leaving comments on this site, I offered a few things you can try in the comments section of this Farmgirl Fare post. Update: Despite spending a huge amount of time dealing with an unexpected and irritating distraction today, I did manage to get some work done in the garden. But now it's very late, and although the chickens enjoyed a freshly harvested supper, I have yet to eat anything myself, so it looks like all the news won't be sprouting until tomorrow. Even if you do not like beets (canned specimens don't count), you should still sow a few rows of beet seeds in your garden this year. Why? Well, just look at this photo. Has there been anything so gorgeous gracing your salad plate lately? I didn't think so. Beets are not only extremely easy to grow but are also amazingly good for you. Beets from the garden are like nothing you will find in the supermarket produce aisle. And while I have been known to devour an embarrassingly large plate of freshly picked, diced beets (no need to peel them) that were slowly cooked in olive oil until caramalized, and then mixed with lots and lots of chopped garlic and cooked for a minute or two more, I mainly grow beets for their greens. One of my favorite varieties to plant is Bull's Blood. Its roots are sweet and tasty (especially when small) and they have lovely pink rings inside. But I recently learned that this popular heirloom is actually grown primarily for its baby leaves, which are ready in as little as 35 days and are, according to my Baker's Creek Heirloom Seeds catalog, "all the rage in salads." 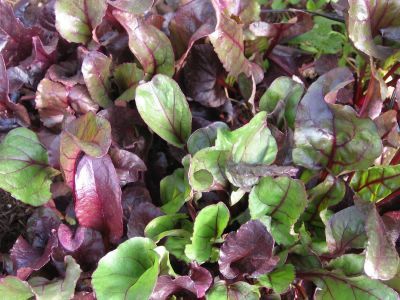 The folks at High Mowing Organic Seeds claim that they are organic gardening pioneer "Eliot Coleman's choice for a red leaf in winter harvest salad mixes." I had no idea I was so chic. 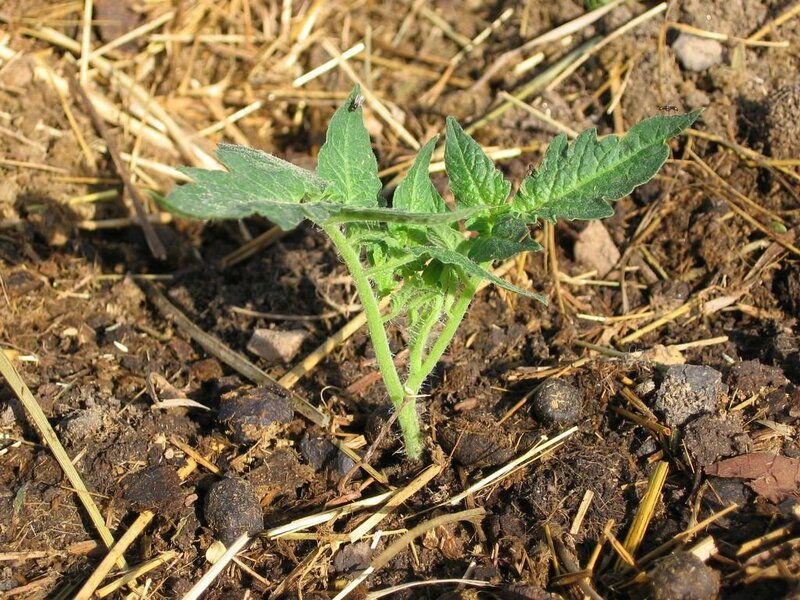 If you do plan to harvest the roots as well as the greens, be sure to thin out your young plants. 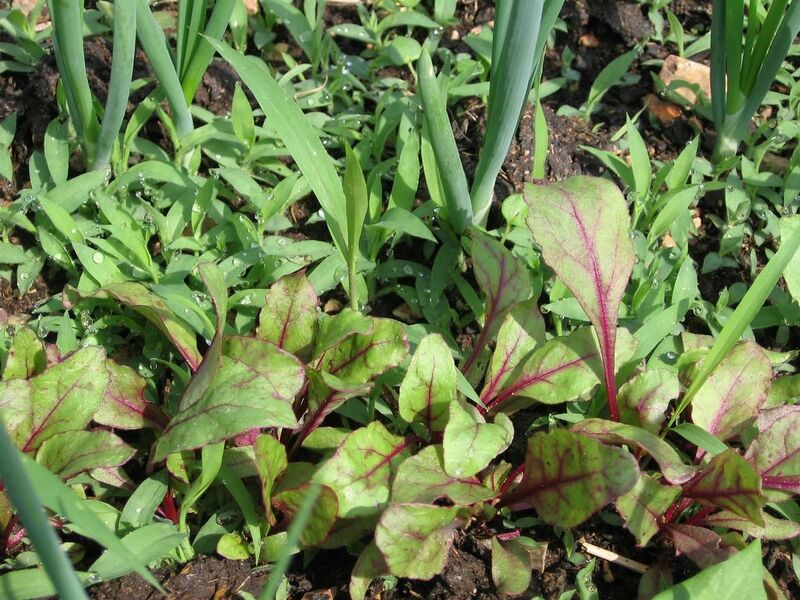 Starting in early March, my faithful beets sprang into action and (helped along with a heavy side dressing of llama pellets and generous, regular watering) started growing like mad. So for very little effort, I am now being rewarded with a delightful and delicious addition to my early spring salads. And you really can't beet that. 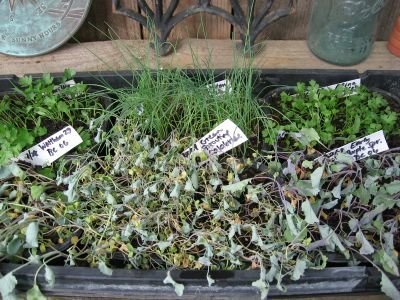 Note: This is my entry for Weekend Herb Blogging #27, a deliciously informative event hosted by Kalyn's Kitchen. Food bloggers from around the world participate, and you never know what interesting new edibles you'll discover each week in the Sunday night roundup. This also fits right in with ARF/5-A-Day. Catch it every Tuesday night at Sweetnicks. Note: My apologies to those of you having problems leaving comments on this site. I just tried to leave one and it wouldn't work, and yet while I was re-entering the word verification over and over (and resisting the urge to tear my hair out), four comments were successfully left by others. There seems to be no rhyme or reason to it. If you have just written a very long comment and don't want to lose it, but Blogger won't accept it, you can highlight it with your cursor, copy it, and then save it to your wordpad or notepad and come back and try to leave it later. I have trained myself to always copy my comments (and blog posts) before hitting Preview or Publish--I learned the hard way, having had too many comment replies that had taken a half hour to write just vanish into thin air. You are also welcome to leave your comments at FarmgirlFare.com Or you can email me: farmgirlfare AT gmail DOT com. Hopefully Blogger will get itself straightened out soon. In the meantime, I appreciate your patience.